Click on the green tabs above to navigate our new website! 1. Call 501-672-1114, leave a voicemail including your name, event date, and brief description of your event. Calls will be returned within 24 hours Monday to Friday. Weekend calls will be returned on Mondays. We are a family owned and operated “part-time” home based business. We do not have a public store-front office, we solely operate from a private warehouse. If we do not answer the phone we are either working our full-time day jobs, assisting customers, out of the office on a delivery, or parenting our children. Your call is very important to us please leave a text, voicemail message, or email and your call will be returned as soon as possible (usually later afternoons or evenings). Please allow at least 24 hours for return calls due to our work schedule. We are a “Mom and Pop” style business. Over the years, we have added to our inventory thanks to awesome customers like you! We appreciate you so much for helping us grow our family business, one inflatable at a time. Calls received over the weekend or on holidays will be be returned ASAP or by Monday. Check us out on Facebook for specials and last minute savings! Lots of videos and photos of our many set ups and parties are posted periodically. Blue Ribbon Bouncers does not operate out of a storefront open to the public at this time. Our part-time home-based business is located in the city of Benton in Saline County. Blue Ribbon Bouncers serves primarily the Central Arkansas metropolitan area. This area includes, but is not necessarily limited to, portions of the following counties: Pulaski, Saline, Garland, Hot Spring, Grant, Jefferson, Lonoke and Faulkner. We try to stay within a 50 mile radius of the location of our home office, in Benton, Arkansas. We will deliver further distances for multiple rentals, large events or festivals. Most deliveries within a 20-25 mile radius of our home office in Benton, Arkansas, are free of charge. We charge delivery fees to areas outside of our free delivery area based on several variables including the current price of fuel, your location, and the time it takes to deliver your rental units. Please keep in mind, we travel to and from your destination twice each day to deliver and then pick up your rental unit. You can view our rates for delivery fees on this website, they are categorized by zip code. If you do not see your zip code, please contact us for a quote. “Concession only” rentals will be charged a nominal fee for delivery. How do I make a reservation for my upcoming party or event? At Blue Ribbon Bouncers, we (Dustin & Susan Rice) are a family owned and operated part-time business. We treat our potential customers like we would want to be treated. Our friendly and helpful customer service speaks for itself. Whether you are a first time inflatable renter or a seasoned professional, we look forward to assisting you in coordinating your event over the phone or by email. At this time, we do not have a dedicated store front, however all of our transactions can be made over the Internet, by phone, email, or in person as needed. Just contact us at (501) 672-1114 or by email at customerservice@blueribbonbouncers.com and we will be happy to assist you in choosing the best rental equipment for your specific needs. Please allow at least 24 hours for us to return your call due to our full-time work schedule. Blue Ribbon Bouncers delivers inflatables year-round. They are very popular options for parties and special events. Therefore, we suggest customers make reservations for specific dates several weeks or months in advance. This is especially true for popular holidays, fall festivals, school activities & fundraiser's, and most weekends. If you are making last minute plans to rent an inflatable please give us a call. Oftentimes we may have inflatables available for your event due to cancellations or openings. We will do everything we can to help make your event a success. Foam parties are typically offered outdoors May thru October. Indoor events are held year round. Do you require a deposit to rent your inflatables or concession machines? What about foam parties? We require a $50 security deposit to hold your reservation date for all rentals and most small foam parties. We can not hold specific dates without this deposit since all reservations are first come, first served. The deposit will be subtracted from your remaining balance. All deposits are refundable due to weather cancellations prior to delivery. Your rental is not confirmed unless we collect a deposit and send you a confirmation invoice. Multiple unit rentals or extra large foam parties for festivals, carnivals, school functions and other large events may require a larger security deposit. Any event where paid workers are requested, or long distances that have to be traveled, require additional deposits as well. Blue Ribbon Bouncers will not provide refunds on deposits for large events or multi-unit rentals. Customers may reschedule events due to rainy,windy or stormy weather only. If you are only renting concession equipment we require you pay for the entire rental at the time of reservation. Foam parties are booked according to predetermined time slots on most weekends. Weekday foam parties offer more flexibility in scheduling. A $50 deposit is required for most small foam parties. Parties requiring large amounts of foam solution must pay a 50% non-refundable deposit down. No refunds are given due to weather cancellations, customers may reschedule their event or will be given a credit toward any inflatable or concession rental. How can I make a deposit payment for my rentals? Do you accept credit cards? We currently accept cash (correct change only), credit cards (Visa, MC, and Discover) and/or bank issued debit cards, and personal or business checks. We do not accept reloadable debit cards issued by credit card companies or major retailers. Please do not send cash via postal service. Credit and/or debit card information for deposits will be taken over the phone by the business owners (Dustin or Susan Rice). Please note we do not keep any credit card information on file after you call to make a payment over the phone. Please have your credit card in hand on the day of the event if you would like to use it to pay the remaining balance. After processing your card a receipt and rental invoice can be emailed to you within 24-48 hours. After I pay for the deposit, when do I need to pay the balance of my rental? All remaining balances are due upon delivery of equipment, prior to set up. We can accept debit/credit cards, checks and cash (correct change only) at that time. Your rental invoice sent via email will serve as your receipt. In the event that a credit card is denied for any reason by our processing company, other payment must be made or the equipment will be removed and the deposit will be forfeited. Please understand, our busy delivery schedule will not allow for us to wait until a customer can run an errand to get payments. Please have other payment arrangements in place, just in case. In the event that a check is returned for insufficient funds or a closed account, a $30 fee will be imposed and the remainder of the balance will be due in cash before any reservation confirmation. Will I have to sign a rental contract when I rent your inflatables or concession equipment or participate in a foam party? All rentals require the customer to sign a rental agreement and copy of rules governing the safe operation of inflatable equipment and concession equipment. The customer who signs the rental agreement is completely responsible for all guests using our rental equipment at all times. Playing on inflatable equipment and operating concession equipment in an unsafe manner can cause personal injury or equipment damage. A sample copy of our contract is found on this website under the Rental Info tab on the main menu. Please read over the contract prior to making reservations. If you have any questions about any of our policies, please contact us for clarification. Foam parties require a release of liability form and a hold harmless rental agreement. 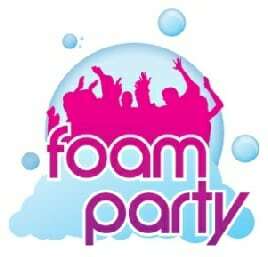 All foam party participants will be informed of basic safety rules upon arrival. The foam machine attendant on duty will provide limited supervision of the party participants for safety reasons, however it the customer’s responsibility to monitor and supervise all foam party participants. Blue Ribbon Bouncers is not liable for accidents or injuries incurred at foam parties. Any unruly foam party participant repeatedly not following safety rules will be required to exit the general foam party area. If you require further clarification please call us. Look below to view our rental agreement. The customer acknowledges that there are a list of safety and operating instructions on the equipment delivered and agrees to read those instructions and operate the equipment in accordance with those instructions. The customer is solely responsible for the correct and safe operation of the equipment. Participants should NEVER wear any type of shoes, including water shoes or flip flops, in the inflatable at any time. No jewelry such as necklaces, long earrings, bracelets or any electronics or telephones are allowed in the inflatable. Every participant’s safety depends on upon the customer providing supervision at all times. Customer acknowledges that there is a risk of injury to a participant or damage to the inflatable when constant adult supervision is not provided. The customer will not permit the equipment to be operated by anyone who has not received instruction on the safe operation and use of equipment, nor shall the customer allow any person to use or operate the equipment when it is in need of repair or when it’s in an unsafe condition or situation. Customer agrees to keep all equipment away from swimming pools and standing water. Customer understands and acknowledges that play on amusement rides entails both known and unknown risks including, but not limited to, physical injury from falling, slipping, crashing or colliding, emotional injury, paralysis, distress, damage or death to any participant. Flipping, piling, wrestling, climbing nets, hanging by cords or waterhoses, or jumping off the top of inflatables are not permitted at any time. Customer agrees to notify Blue Ribbon Bouncers immediately if any accident involving injury occurs while using any equipment. Customer agrees to hold Blue Ribbon Bouncers harmless from any and all liability, claims, demands, causes or rights of action whether personal or a third party, which are in any way connected with participation in this activity, including those allegedly attributable to negligent acts or omissions. Customer agrees to hold Blue Ribbon Bouncers harmless for any such legal fees and costs that may arise to enforce this agreement. Customer agrees to pay the rental fee at the time of delivery and the rental term shall be listed as the delivery date and start/end time on the invoice page of this agreement. If any equipment is delivered by BRB and is accepted by the Customer, then Customer shall not be entitled to any refund whatsoever even if the customer elects not to use the equipment due to weather or other causes. The Customer agrees to deflate the inflatable immediately during unsafe weather conditions such as high wind gusts over 15 mph, rain, sleet, hail, lightening, etc. In the event that a check is returned to BRB for insufficient funds, the customer must pay the total price as well as an additional $30 fee. Customer agrees to give representatives of BRB true right to enter the property address as listed on the invoice for delivery, required set up, and for subsequent pick up of rental property and any associated equipment or materials at the approximately specified times. Customer agrees to keep all pets and animals secure and free from the set up area at all times. All inflatable units must be secured by ground stakes (up to 18 inches) and/or sandbags. Customer is responsible for marking all underground utilities and sprinkler systems prior to delivery and will not hold BRB responsible negligent for any damages. Customer agrees to remove all debris from the setup area and surrounding perimeter including garbage, plant materials, limbs, rocks, sharp objects, animal feces, ant hills, toys, and other obstructions. Customer’s right to possession of rental equipment begins upon the items being delivered to the customer’s premises and terminates on the actual pick up by Blue Ribbon Bouncers. Retention or failure to permit the pick up of items at the end of the rental period specified on the contract, constitutes a breach of this contract. In the event that the equipment is not returned for any reason, including theft, the customer is obligated to pay BRB the full replacement value for all equipment listed on the invoice page of this agreement, plus any incidental costs associated with the attempted pick up or recovery of the equipment by Blue Ribbon Bouncers. Customer agrees to hold BRB harmless from all claims and costs arising from such retaking and/or levy. If rental items are moved from the delivery address for any reason, the customer should notify BRB immediately. Customer is financially responsible for any and all damage to any of the rental equipment not caused by ordinary wear and tear: defined as, but not limited to, cutting or tearing of vinyl or netting, damage due to overturning, overloading, exceeding rated capacities, breakage, improper use, abuse, lack of cleaning, contamination of or dirtying of rental equipment with non-approved items such as chemicals, food or drink, paint, confetti, glitter, silly string, mud, clay, or other materials. Customer agrees to keep the interior/exterior of all rental equipment free of debris such as plant materials, rocks, animal feces and any sharp objects. Silly String, found in an aerosol can in most party supply stores, contains a chemical that causes irreparable damage to inflatable equipment. If silly string damage is found on any equipment, a $500 fee shall automatically be imposed by BRB and shall be due immediately and payable by the Customer. Individuals with head, neck, back or other muscular-skeletal injuries or disabilities, pregnant women, small infants, and others who may be susceptible to injury or falls, bumps or bouncing are not permitted in the unit at any time. Foam party participants may be at greater risk for slips and falls due to the foam fluid/water solution. The foam fluid may cause skin and/or eye sensitivity in some individuals. Have guests wear goggles and test the foam on a small area of skin prior to immersing full body in foam. Blue Ribbon Bouncers is not responsible for any damage or injury caused by playing in foam. Our cancellation policy states that all deposits on rental equipment are non-refundable, except for weather cancellations made by BRB. Customer agrees not to allow alterations to the equipment of any kind. No soap, chemicals, cleaners, etc. If you purposely add water to a dry slide you will be charged the full price of a waterslide plus an additional $50 cleaning fee. If a dry inflatable becomes wet, have an adult wipe it down with a towel to prevent slipping or falling before riders return. Customer agrees to obtain permission from park officials when renting inflatable equipment to be used in any type of public or Private Park. All fees, permits, licenses, fines, or taxes must be paid by the customer. The customer is solely responsible for obtaining all permits. Failure to get permission from park officials may cause your event to be cancelled immediately. Refunds will not be given. Customer acknowledges that they have had sufficient opportunity to read this entire agreement, and agree by all terms and conditions on all pages and they understand its content and that they execute it freely, intelligently and without duress of any kind. This rental contract constitutes the full agreement between Blue Ribbon Bouncers, LLC and the Customer. I hereby knowledge, as witnessed by my signature, that I understand each of these rules and agree to abide by them completely. Do you charge sales tax for your rentals? We charge sales tax applicable in your area in accordance to state law. Sales tax will be based on the percentage charged in the local city of the delivery, if any, plus state sales tax. Do you allow customers to pick up inflatables and set them up themselves? Can we operate our own foam machine rental? At Blue Ribbon Bouncers, we do not allow customers to pick up their own rental units and set them up themselves. Our highly trained and professional delivery staff have undergone safety training pertaining to the correct set up of inflatable equipment to ensure the safety of your family. We pride ourselves on being the only inflatable business in Central Arkansas to undergo this sort of yearly training through the Safe Inflatable Operators Training Organization (SIOTO). We will deliver your units, set them up, anchor them securely, and show you how to operate the blowers and other equipment. This leaves you more time having fun and less stress about worrying about setting up heavy, bulky equipment. Foam machines are only to be operated by a Blue Ribbon Bouncers employee. A foam machine operator is provided at all foam related parties and events and is included in the party package cost. Where can I have an inflatable unit delivered? Our inflatable units can be set up at a variety of locations including private residences, businesses, schools, churches, daycares, parks, ball fields, indoor gymnasiums, civic centers, family life centers, etc. Due to insurance regulations, we are unable to set up our inflatable units at an apartment complex or multi-unit residence. We recommend these customers rent a pavilion in a park, or at an appropriate indoor facility such as a gymnasium, or ask a relative or friend to hold the party at their private residence. Most all of our inflatable units are tall (about 16 to 25 ft. High) and long (some up to 60 ft.) and therefore require large areas of horizontal and vertical space to be set up whether indoors or outdoors. Contact a Blue Ribbon Bouncers representative for specific size measurements for a particular unit. All inflatables must be within 100 feet of a power source. Generators are available for rent if you need electricity for an event. Where is the best place to have a foam party? Foam parties are best held at private residences in a large contained area or in fields or fenced backyards. Foam will “creep” all over the yard and fly through the air with the breeze. Please be mindful of your neighbors, especially those close by, and how they will react to your foam-filled yard, especially if the wind blows piles of bubbles onto their property. Its best to discuss your party plans with them before the event to eliminate any issues that may arise. We can not offer foam parties at apartment buildings, condos, hotels, dorms, duplexes, trailer parks or other community or shared areas. Foam parties can be offered at local parks and recreation areas only with written permission from the overseeing official person governing the park. Persons who inhabit rental property should get the landlord’s permission to host a foam party ahead of time. Can I have an inflatable unit delivered to a park? We allow and encourage inflatable rentals to be set up and used at city and public parks. Oftentimes, these are the best locations for oversized rental units due to space restrictions at home. All inflatable rentals must have a pavilion rental to provide electricity for our blower units. The inflatable unit will be available for use during the pavilion rental period only. We can not set up inflatables early or take inflatable units down later than your pavilion rental. It is the customer’s responsibility to make sure electricity and water is provided for inflatable usage. Customers must get verbal or written permission from park officials and pay for any permits or fees before an inflatable unit is set up in a public or city park. Failure to get permission can result in an immediate cancellation of your event. At this point, all payments are non-refundable due to noncompliance with rules. How long can we rent your inflatables or concession equipment? We want you to be able to enjoy your rental unit for as long as possible. We generally begin delivering rental units between daylight to noon and pick them back up between 6 p.m. To 9 p.m. All of our prices reflect at least a 6- 8 hour rental period, but sometimes longer depending on the delivery schedule for that day. We do not offer half-day or hourly rental prices. Our prices are the same whether the unit is rented for 2 hours or 7 hours, so why not enjoy yourself all day. Your children or guests can play before, during, and after the party at your convenience so there is no need to feel rushed or hurried. Some customers rent multiple units for holidays, family reunions, or private parties and split the total cost to save money. Can’t afford the larger or multiple rental units or expense of a foam party? Church groups, daycares, summer camps and other organizations typically charge the parents a few dollars a child to assist in providing a day of fun. If you require specific drop off and pick up times, please notify us ahead of time. We will make every effort to accommodate your needs. All daily rentals must be picked up by 9 p.m. Occasionally, we may run late picking up a unit, however we will contact you in this event. Extended rental hours require prior authorization and may require additional fees. We do offer discounts for multiple day and multiple unit rentals, just ask. Once a deposit is received and your event is confirmed, we do not offer refunds except due to weather cancellations. We know that sometimes customers have to cancel their reservations due to unforeseen circumstances, therefore please notify us of the pending cancellation prior to the event as soon as possible. Blue Ribbon Bouncers will not refund any reservation deposits if an event is canceled by the customer once the delivery truck is in transit. All deposits are forfeited. Blue Ribbon Bouncers can not guarantee weather conditions for outdoor events. We operate under the strict guidelines of the Arkansas Department of Labor and must follow their rules for using inflatable equipment at all times. Therefore, we reserve the right to cancel your event, at any point, if severe weather conditions are present or imminent or we have any reason to believe that the inflatable equipment or its users are in danger. Examples of severe weather include: high winds or excessive gusts (above 15 mph), moderate rain, standing water in the set up area, forecasted widespread thundershowers, temperatures below 40 degrees, sleet, snow, hail or lightening. We monitor weather conditions constantly. If a possible weather cancellation should occur, we will contact you the evening before or the morning of your event, prior to delivery. We understand that good weather plays an integral role in the success of your outdoor inflatable rental party or foam party. It is not our intention to charge customers for a service in which we can not fulfill due to imminent or deteriorating weather conditions. If your event is canceled by Blue Ribbon Bouncers due to inclement weather, we will work with you to reschedule your event, provide credit for any other rental in our inventory to be used at another time, or we will refund your deposit. All credit must be used within 1 year. **Weather cancellations requested by the customer will only be considered within 48 hours of the scheduled event. Due to changing weather conditions, we do not rely on weather forecasts more than 48 hours out from the day of your event for refunds. Arkansas weather can be tricky to forecast, we try to avoid canceling any scheduled event unless we have to due safety reasons. Outdoor foam parties will be canceled before delivery due to rain. Our foam is water soluble and therefore it will simply not produce adequate foam in wet conditions. Foam fluid can only be mixed appropriately for use in weather 65 degrees or warmer. Refunds may require up to 14 business days to process. Please note: once a rental unit is in route for delivery, we DO NOT give refunds due to weather. If weather is questionable, we always will attempt to call the customer before leaving our warehouse. Can we cancel our reservation and get a complete refund due to cold or hot weather? Blue Ribbon Bouncers delivers inflatables for indoor and outdoor parties year-round. Arkansas weather can be extremely unpredictable. If you are concerned about hot or cold weather temperatures, it is suggested that customers consider hosting an indoor inflatable party by renting a gym, church family life center, boys & girls club or other facility with high ceiling clearance of at least 20 feet tall. If you schedule an outdoor party, we set up all inflatables unless the air temperature falls below 40 degrees F. Windy conditions (above 15-20 mph) are cause for cancellation and your deposit will be refunded. However, no refunds are given if you choose not to use the inflatable or take part in a foam party due to cold or excessively hot weather. You are always welcome to cancel your reservation, prior to delivery, and forfeit your reservation deposit. Foam parties are most comfortable in temperatures of 65 degrees and above, although some adventurous people are welcome to participate in colder temperatures as long as hot water is on site to mix our foam fluid appropriately. What information will I need to disclose when I make a reservation? We will need all of your contact information including your name, mailing address, phone number, and email address (if applicable) to a make a reservation. If the rental location is different than your mailing address we will need that information as well. If the rental takes place at a park or other public facility please have the street address, including zip code available when you make the reservation. Blue Ribbon Bouncers will make every effort to accommodate your specific needs prior to delivery. It is the customers responsibility to inform us of specific obstacles affecting your rental delivery such as unlevel set up areas, steep driveways or hills, ditches, tall grass or plant covering, mulch, gravel, gates, swing sets, swimming pools, stairs, steps, sprinkler systems, fences, small gate openings, underground utility lines, overhead tree limbs, or power lines. Customers living in gated communities will need to provide security codes to allow our delivery drivers access to your address. Our inflatables weigh hundreds of pounds and must be transported on an oversized dolly at all times. Many customers underestimate the size of an area some of our inflatable equipment must have to be used. We will give you size measurements and you are highly encourage to measure your space before delivery. Deposit fees will not be returned if the rental equipment will not fit in the allotted spaces, or if set up conditions are unacceptable (garbage, rocks, sharp objects, children’s toys, pet feces, mud, plant materials, chemicals or oil, excessive dirt/dust (especially when used around waterslides), ant hills, etc…. All pet feces and ant hills MUST be cleared in the general play area, prior to delivery. Due to delivery scheduling, Blue Ribbon Bouncers reserves the right to refuse service if set up areas are not accessible or clean upon arrival. All deposits will be forfeited. Additional charges will apply if delivery persons must wait, if our schedule allows, for customers to prepare a set up area. Full payment is due on delivery, no exceptions. What can I expect upon delivery of my rental equipment? On the day or evening prior to your reservation date, we will contact you to confirm your reservation and get general directions. We will give you a time window to expect our delivery persons. All customers are required to be present when the rental equipment is delivered to the address specified by the customer. If a customer or other person does not arrive by the agreed time, or within 10 minutes, the equipment will not be set up and the deposit will be forfeited. Customers should agree to give BRB true right to enter gated subdivisions and/or the property at the delivery address for set up and pick up. All security information is destroyed following the rental. The customer agrees to provide electricity in the form of a standard 110 electrical outlet for each rental unit blower and water if necessary. The customer should provide all plug adapters for a 3-prong electrical cords (if needed) for electricity usage. Blue Ribbon Bouncers retains all rights to retrieve their property at any time during the rental period. Customer agrees to keep all rental equipment and accessories in their possession at all times and may not be moved for any reason. Moving an inflatable or sandbags/stakes is absolutely NOT ALLOWED for safety and insurance reasons. We will be happy to put the inflatable anywhere you choose as long as its accessible and safe. Photos of the set up area at every rental will be taken for liability purposes. What is involved in the professional set up of an inflatable unit? Before set up can begin, customers are required to clean the set up area and a 20 ft. surrounding perimeter of all debris, including sharp objects, rocks, toys, pet feces, sticks, garbage, chemicals or oil, plant materials such as pine cones, sweet gum balls, fruit, nuts, etc. All rental units must be secured by metal stakes (12 to 18 inches in length) or sandbags, NO EXCEPTIONS! Each corner and other points around the inflatable must be secured to prevent overturning. Please inform us prior to delivery if your rental location requires the use of sandbags (concrete/asphalt or hard,rocky surfaces) instead of stakes (grassy areas). For obvious reasons, all indoor rentals require the use of sandbags. We carry a limited number of sandbags on our delivery vehicle due to the excess weight. What is involved in the set up of a foam party? Most foam parties are booked for 2 hours of party time. 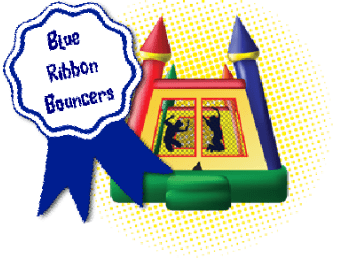 A Blue Ribbon Bouncers employee will arrive at your party destination approximately 30 -45 minutes before your rental time to set up equipment for your party, including inflatables and concession equipment. Beginning at the agreed party start time, foam fluid will be produced and/or maintained however the customer desires. Most customers choose to keep a somewhat steady flow of foam over the course of approximately 1 to 1 ½ hours. We rarely run the foam machine continuously for 1 hour straight due to the amount of foam it can produce. Foam fluid can be administered off and on anytime during the 2 hour party time frame until the amount of fluid you purchased for your party it is gone. Just let us know what you prefer the foam machine operator to do for your event. At the end of your 2 hour party time frame, the Blue Ribbon Bouncers employee will remove the foam machine, provide a quick water clean-up, and remove all inflatable equipment from the premises. What age groups are recommended to use your inflatables? Some of our inflatables are designed strictly for children ages 12 and under, while others can accommodate children ages 3 to an adult. We encourage you to enjoy your inflatable rental with your children, however please be mindful of the weight limits posted on the front of each unit. Group together children based on their overall size and weight to prevent injuries. It is highly suggested that young, smaller children play together and older, heavier children play together. Never allow persons of unequal size to to use our inflatables at the same time. This type of use can lead to physical injury and damage to the inflatables. Any indications of improper usage can lead to damage charges up to and including complete replacement fees. Bounce Castles: Ages 2 to 12 (6 to 8 children at a time, based on weight). Extra caution must be used when used with younger or small children. Parents are welcome to enter the bouncer and sit down while younger children bounce to provide support. Bouncer Slide Combos: Ages 3 to 12 (5 to 10 children at a time, based on weight). This unit is perfect for parties with children of various ages. Younger, or less adventuresome children, can jump in the bouncer while older children will love to slide down the 13’ tall slide. This unit can be used dry or as a waterslide. Extreme caution should be used with this unit with small children. Although the optional splash pool is only about 2 feet deep, your total supervision is required for this ride. 18 ft. Or 16 ft. Tall Giant Slide: Ages 3 to adult (3 riders on the unit at any one time. Single lane slide, only one person can slide at a time.) These slides are huge at almost two stories tall and 30 feet long! Riders will descend 18 or 16 feet into an inflated wet or cushioned dry pool. Riders must be seated or laying flat on the ride, no sliding head first or backwards please. No jumping is allowing from the top of the slide at any time. Extreme caution is required with this attraction due to its height, speed and splash pool. Your total supervision is required for this ride.at all times. Foam can be added to the these inflatables for an extra charge. Slip & Slide Water Ride: Ages 3 to adult (single lane slide, used by one person at a time only). Our 30 ft long slip & slide stands approximately 2 feet off the ground and features three arches of continuous sprays of water throughout the ride. Riders need space to get a running start to use this attraction properly. This slide is equipped with an inflatable stop bar at the end to prevent falls. Foam can be added to the these inflatables for an extra charge. Giant Screamer Slide: Ages 5 to adult (3 riders on the unit at any one time, single lane slide.) This is our biggest, fastest slide at over two stories tall and almost 60 ft long! This humongous slide is perfect for children and adults. Extreme caution is required with this attraction due to its height and speed. This slide is equipped with an inflatable stop bar at the end to prevent falls. Foam can be added to the these inflatables for an extra charge. Do you clean your inflatables regularly? All of our inflatables and concessions are cleaned and sanitized regularly using environmentally friendly and child-safe products that kill mold, mildew and major germs and viruses. We want your rental unit to be as clean as possible, therefore all touchable surfaces are sanitized after inflatable rentals and all units undergo a deep cleaning regularly. We keep maintenance records on all of our rental units and we are welcome to share them with our customers upon request. We pride ourselves on being able to provide newer, cleaner and more colorful rental units than most of our competitors. Are your inflatable units commercial quality? We only deal with inflatable products of top notch commercial quality vinyl. We do not carry any flimsy residential-style equipment you can purchase from major retailers. Our inflatables are built to last! You may find some of our units at large festivals, church events and corporate parties. Several of our inflatable units are designed for child and adult use. Weight limits are posted on each inflatable unit. At Blue Ribbon Bouncers, we take your family’s safety seriously. We are fully licensed, insured and inspected bi-annually as required by Arkansas state law. We will be happy to provide documentation of our business license, insurance, and state inspection records to our customers. As parents of three young children ourselves, your child’s safety is our first priority. Whether you choose to rent from us or not, please make sure the company you use is fully insured, licensed and inspected for the safety of your family or party participants. The majority of inflatable accidents and injuries you hear about in the media occur at the hands of people who do not operate business legally or who are uninformed of basic safety protocols (anchoring and weighing down inflatables). Don’t take chances with unreputable inflatable owners or “loaner” inflatables just to save a few dollars. It’s best to allow professionals to properly install and anchor all equipment for events. Does the vinyl get hot during warm weather? As with any surface in the hot Arkansas summers, vinyl tends to get hot. However, we try to only purchase commercial quality equipment that comes with added safety features. All of our bounce houses and bounce house/slide combos feature a sunshade to help reduce the exposure to hot vinyl. The best way to reduce the risk to hot vinyl exposure is to make your inflatable rental a water ride or incorporate foam to the inflatable. All of our combo units and giant slides can be made into waterslides. Slip & slides are also available and are great alternatives to traditional dry inflatable rides. Foam added to a slip and slide can make a great slippery alternative to a water slide. Why do you not allow silly string, paint, stickers, confetti, or glitter near your inflatables? Please do not use any glitter, stickers, confetti or paint near our inflatables. Let’s face it, we all know the mess that confetti and glitter can bring with any party. Its hard enough just to sweep it up, let alone have to pick it up piece by piece out of inflatable equipment with lots of nooks and crannies. Additional cleaning fees will be charged, with a $100 minimum. Silly String, a popular party item sold in an aerosol can, causes irreparable damage to vinyl. In fact, it contains a chemical adhesive that eats the vinyl causing holes, tears, discoloration, etc… Once the damage is done, its nearly impossible to properly clean and repair the inflatable therefore making it unusable. Blue Ribbon Bouncers will impose an automatic $500 fee up to and including the total replacement cost of the inflatable as listed in our contract. Be smart, leave all silly string, stickers, confetti, and glitter far away from inflatable equipment. Can I rent an inflatable overnight? All of our inflatable equipment must be picked up from delivery sites by 9 p.m. We will make every effort to accommodate your event if it runs later than nightfall. If your party will be continuing past our regular rental hours, additional rental fees and labor charges may apply. Do you provide workers for multiple rentals or for large events? Blue Ribbon Bouncers can provide ride attendants for hire for your event. Our ride attendants assist event-goers to productively form a line to each ride. They also prevent line cutting, pushing, horseplay and assist riders in entering and exiting the unit safely. Your child’s safety is our top concern at these events, therefore let us attend to the riders while you enjoy all the fun. All of our workers are required to be at least 18 years old and must undergo training sessions teaching the safe operation of inflatable equipment with a certified safety representative from our staff. We can provide multiple workers for your event on request, however please send in all staffing requests as soon as possible. If you are interested in obtaining workers for your event please contact us for more information and event costs. Rental units provided to schools, churches, or some other organizations where activities will be monitored by teaching staff or responsible adult volunteers may not be required to have paid workers from Blue Ribbon Bouncers for events. Please contact Susan or Dustin at 501-672-1114 to further answer any questions you may have concerning workers for events. All foam parties require a party attendant/machine operator. This is included in the cost of the party. These employees are responsible for equipment and general safety of the foam party participants only. They do not provide child supervision in absence of other adults. Adults must be present during all foam events. Do you offer discounts on your rental equipment? Usually there is an inflatable rental for almost every budget. Our inflatable rental units start around $150 for a full day of nonstop fun and go up from there. We provide discounts on multiple inflatable units and concession rentals every day. Our homepage also displays weekly advertised specials on our inflatables and concession rentals. We advertise in Central Arkansas’s Kids Directory and occasionally offer coupon deals as well. Be sure and mention these specials at the time of your reservation. Can’t afford the larger or multiple rental units? Church groups, daycares, summer camps and other organizations who need financial assistance to rent inflatables or host foam parties often charge the parents a few dollars a child to assist in providing a day of fun. Will Blue Ribbon Bouncers donate or discount inflatable equipment or concession rentals to charitable causes and other community related events? We are actively involved in a variety of organizations and participate in multiple community events across central Arkansas. Each month we randomly choose several non-profit and/or community related events where we donate our services and staff. We love helping a variety of causes and are thankful we can bring smiles to children through the use of our inflatable equipment. We certainly try to give back to the community as often as our schedule allows. If you are interested in submitting a proposal for a donation or discount of rental equipment for your event please do the following. Send in your request by email or on official company or organization letterhead stating the date and a detailed description of your event. Make sure to include a contact name, phone number, and email for your event coordinator. Please put for federal nonprofit ID # on the form as well. You will be contacted by phone or email when we receive your request and you will be notified in a timely manner as to the status of your request. You are welcome to submit proposals each year, however please send in requests at least 2 months in advance of the event date. Donations and/or discounts are only considered for non-profit organizations, charitable fundraisers and community related events only. Private parties are generally not applicable. Multiple discounts are available for groups interested in fundraising. Fundraising by gaining profit off inflatable usage by event goers is only allowed with prior written approval only. Customer agrees not to allow alterations to the equipment of any kind. No soap, chemicals, cleaners, etc. If an inflatable becomes wet, have an adult wipe it down with a towel to prevent slipping or falling before riders return. If you can think of any other questions not listed above, please let us know!